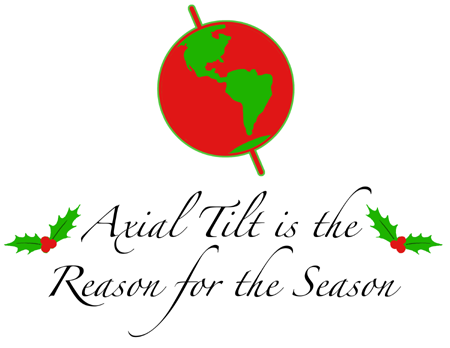 Author azriflemanPosted on December 25, 2008 Categories SCIENCE!2 Comments on Merry Christmas! After a pleasant 12-hour drive from the Phoenix metro area, I’m back in San Francisco to visit friends and family over the winter break. Alas, I didn’t bring any of the guns. If anyone in the Bay Area wants to say hello and meet up in person, let me know. My wallet hurts. I made a rather substantial and time-sensitive non-gun purchase recently (it must remain a secret for now, but I’ll tell you in a few weeks). Unfortunately, this means I had to go a bit in debt. Even though it’s for a very good purpose, I really hate being in debt. To use a metaphor, I hate being in debt with the burning fury of a thousand desert suns (and living in Arizona, I know what desert suns feel like!). To add insult to injury, my renter’s insurance is up for renewal (hooray bills!). While Allstate has been pretty good to me ($5,000 firearms rider for $20/year [$5,000 total, $2,000/item] in addition to my normal renters policy), I’ve been switching all of my insurance (car, motorcycle, etc.) to USAA. USAA has far better rates on auto and motorcycle than GEICO, but their renters base rate is just a little bit pricier than Allstate. Their Valubable Personal Property rider for things like jewelery is quite reasonable, but they don’t offer a blanket firearms rider like Allstate does. The renters insurance covers a certain amount for guns ($2000 total, $1000/each), but the value of my guns exceed those limits, so I had to go with the scheduled policy: each gun must be individually listed, and I have to provide the make, model, caliber, serial number, and value. While I was a bit uncomfortable with providing this information for each gun I own, I figure it’s not terribly uncommon (they do the same thing with expensive cameras and other items) for an insurance company to require it so it’s not a huge deal. While $85/year for the guns policy was quite a bit more than the $20/year Allstate offered for their blanket coverage, my net insurance costs went down (I’m saving $300/year with USAA auto insurance vs. GEICO), so that’s fine with me. There’s also no deductible, which is nice. For anything over that limit, I have the NRA ArmsCare insurance ($1,000). The ArmsCare Plus coverage was actually more expensive than the rider from USAA. Collectibles Insurance estimates a cost of about $47/year to cover my collection, but I have no experience with them, and am not sure how good they are. Evidently their policies don’t cover guns carried regularly for self-protection (presumably my NRA ArmsCare would cover this, but I’ll have to look into it), which is a bit of a concern. Is the amount I’m paying for the USAA rider reasonable? It seems a bit steep to me, but I really don’t know anything other than Allstate’s blanket policy (which, I think, had a $250 deductible). My friend Teresa was complaining that she hadn’t been shooting in about a year, and that this state of affairs was intolerable. She also wanted to bring her boyfriend Chad, a stringer for a local news company (alas, I forget the details), who had never been shooting before. We decided on going to the range on Saturday, December 6th. 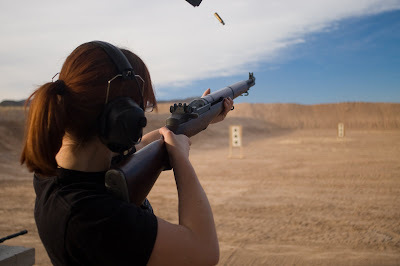 Rita, a fellow student of science and friend of Teresa and I, seems to have a long-running love affair with my M1 Garand, and so insisted on coming. BeMasher, a friend, co-worker, and amatuer photographer came as well. 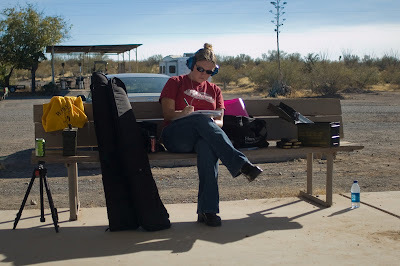 My girlfriend Sarah, also came to the range, but had various work from her students that she needed to grade, and so didn’t shoot. 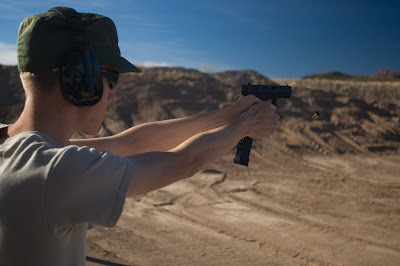 Everyone reviewed (or learned for the first time, in Chad’s case) the four basic safety rules prior to arriving at the range, and again before we started shooting. 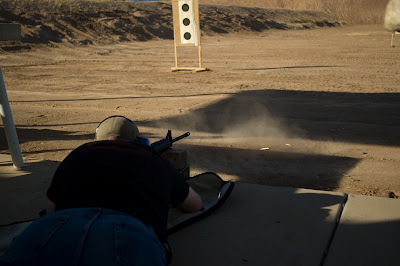 Chad started out, as all new shooters who come with me do, with the suppressed Ruger 10/22. 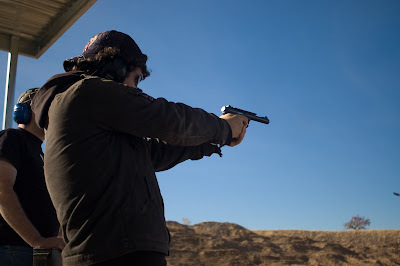 After getting the feel for it, he moved up to the Ruger MkIII .22 pistol, then the Sig Mosquito belonging to BeMasher’s brother, and then to the Glock 19. With the extended 33-round magazines, the Glock seemed to go over well with everyone. 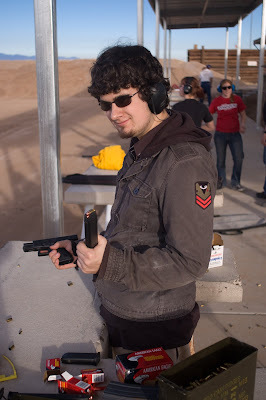 Everyone else had a good deal of experience with the different guns I have, and so got started shooting the other guns I brought while I instructed Chad. He’s a quick learner, and rapidly got the hang of things. 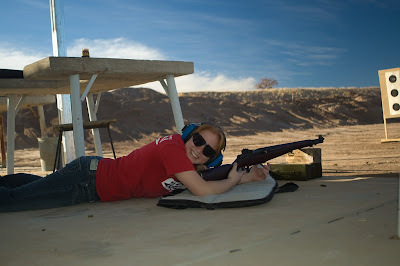 Teresa really enjoyed the suppressed 10/22, and spent quite some time draining my subsonic .22LR supply. The stock on the 10/22 seems to be a great compromise in size — people both large and small seem to be able to shoot it comfortably without any issues. The Trijicon Reflex II red dot sight is also excellent (“put the dot where you want to shoot, then pull the trigger”). The fact that it requires no batteries to illuminate the red dot is a major plus. Even though BeMasher spent a lot of time photographing, we managed to steal the camera from him from time to time, and got a few pictures of him shooting. Whenever there’s a group at the range, I seem to assume a sort of supervisory role, and don’t get to shoot much (terrible, I know!). 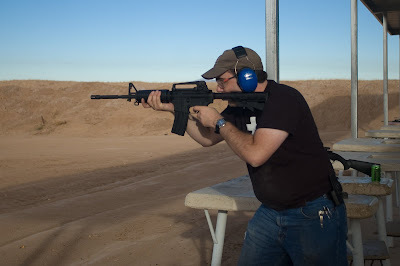 Everyone insisted that I get some trigger time, so I did some shooting with my new DPMS 16″ M4gery. As expected, it’s accurate and pleasant to shoot. 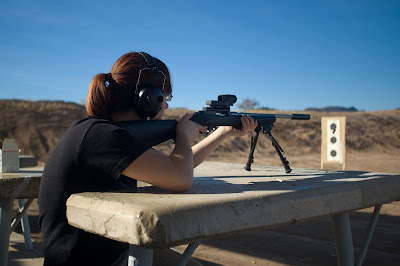 The adjustable stock made shooting from the prone much more comfortable than a fixed stock, particularly for those of smaller stature. Unfortunately, some of my reloads caused some problems (the bullets weren’t entirely round, a side effect of being pulled from de-milled military ammo), so I substituted my 20″ Bushmaster AR in while I was clearing the 16″. This worked out surprisingly well — at the relatively short (25-50 yards) distances we were shooting, the points of aim of both rifles were close enough to be indistinguishable. Unsatisfied with the light recoil of the AR, Rita decided that she’d be satisfied only in shooting the M1. 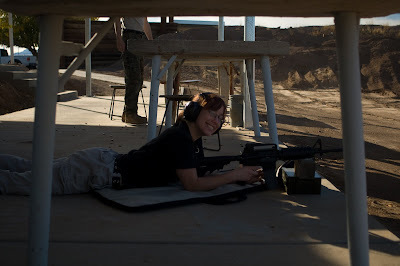 For being such a tiny person (she’s only 5’2″), she handles the recoil of the M1 far better than many of the larger people I know. Shooting the M1 prone is a pain, as it seems to recoil directly into one’s collarbone, yet she was able to handle it extremely well. I suspect that if there was ever a zombie attack, one could give Rita an M1, a few bandoleers of ammo, and some high ground, and she’d take care of the problem. I observed a rather amusing quirk to her shooting style: whenever she’d fire from the prone, her legs would flex rapidly at the knees, and her feet would jump about a foot in the air. This didn’t seem to affect her accuracy, but was quite amusing to watch. Teresa also fired the M1, but preferred to shoot it standing. 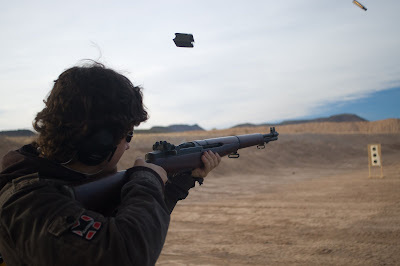 Upon seeing his girlfriend shoot the M1 (and exclaiming that the muzzle blast was quite a bit louder than the ARs), Chad decided that he too would have to shoot it. My lovely girlfriend was listening to her iPod headphones underneath a set of earmuffs, and so graded all her documents without being troubled by the gunshots occuring nearby. She had a secondary duty as Keeper of the Ammo, and frequently provided fresh AR magazines, M1 clips, and boxes of .22LR as needed. Between that and her love of tasty beer and football, I must be the luckiest guy in the world. I bet her students have no idea what was going on while their papers were being graded. 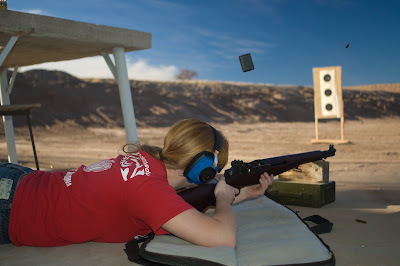 Once again, a beautiful December day in Tucson, and a great day at the range. My record of “everyone leaves the range with a smile” continues unbroken. The only problem I’m running into is that I don’t know many non-shooters, and so I’m not able to take more to the range. 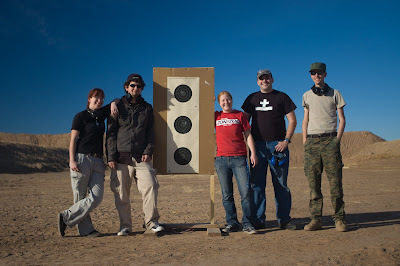 If you’re a non-shooter (or know some) in the Tucson area and want to learn to shoot with a bunch of physicist-astronomer types, please don’t hesitate to contact me. 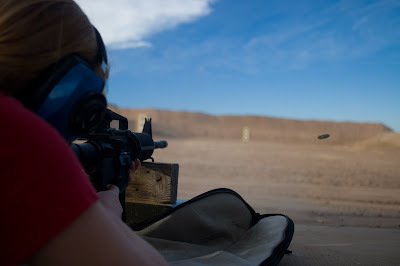 I’d like to particulary encourage (in no particular order) women, minorities, journalists, and politicians to learn to shoot with us in a fun, safe, and encouraging environment. All photos are copyright BeMasher and are available in their original form at his album. Photos are mirrored by me for consistent hosting, so as to avoid dead links and images in the future, and are displayed here in accordance with BeMasher’s licensing of the pictures under a Creative Commons BY-NC-ND license. If you wish to be known under an alias or pseudonym, I will be happy to refer to you as such. Please let me know what name you’d like to be called and I’ll do my best to refer to you as such. If I make some sort of mistake in your name, or failed to address you in the manner in which you prefer, please don’t hesitate to contact me and I’ll gladly change it ASAP. I previously referred to people by the first letter of their first name (e.g. “John” became “J”), but discovered that I know several people with names starting with the same letter. Collisions and limited namespace became a problem. As such, I will refer to people by their first names by default (see policy on pseudonyms above). I trust this will not violate anyone’s privacy or identities, as first names are hardly unique. It’s nearing the end of the semester, and everything needs to be done at once: a lab report, homework, and 200 exams that I need to grade are all due tomorrow…followed by studying for finals. Forgive me if things get a bit slow for the next week or so. As gun sales shoot up around the country, President-elect Barack Obama said Sunday that gun-owning Americans do not need to rush out and stock up before he is sworn in next month. Obama and Biden would repeal the Tiahrt Amendment… support closing the gun show loophole…[and] support making the expired federal Assault Weapons Ban permanent. I’m a lawful gun owner. A new “assault weapons ban” would likely affect the majority of the guns I own and use on a regular basis. The Tiahrt Amendment keeps ATF trace data from being misused for misleading politicial purposes (even the ATF supports the Tiahrt Amendment). The “gun show loophole” has nothing to do with gun shows or loopholes — it’d be a ban on private person-to-person sales. Does this mean I do have something to fear? I’m seeking a small, high-quality, wifi*-based webcam. It must have the capability for live streaming access over the web (that is, I can access the camera remotely and see live views of its coverage area), and the capability for motion-based taking of photos/videos (can be either or both). Must be able to send motion-based taking of photos/videos to a remote location, such by email or FTP. Why? I tend to be out of the apartment a lot. While the guns are secure in the safe, a potential thief would have little problem entering the apartment and having near-unlimited time to open the safe. If that occurs, I’d like some evidence to present to the police and/or my insurance company. Any advice? I’ve been looking at these cameras, but they’re pricey. * Must support WPA2-PSK with AES. WEP is absolutely out of the question. Who watches the watchmen? These guys. The trap was set and less than 24 hours later, the Odessa narcotics unit raided the house only to find KopBuster?s attorney waiting under a system of complex gadgetry and spy cameras that streamed online to the KopBuster?s secret mobile office nearby. There’s no excuse for the police’s behavior. I’m glad to see that someone is “watching the watchmen”, and hope these cops get slapped hard by a judge. Author azriflemanPosted on December 6, 2008 Categories Crime, Police2 Comments on Who watches the watchmen? These guys.